For Full Details on the Stock Service System™ Click Here. 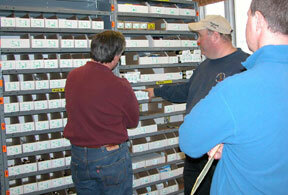 From left to right: Bill Bowler, a Hodes Co. rep; Tom Mahoney, coowner of Mahoney Plumbing; and Joe Hodes, owner of Hodes Co., examine an installed Stock Service System™. Hodes Co., located in Kansas, City, Missouri, offers a unique inventory control system, called the Stock Service System™, to help contractors become more efficient and profitable. President Joe Hodes said the company customizes the Stock Service System™ to match the needs and budget of any size business, whether or not they buy from Hodes. "Inventory control is our core business expertise; therefore, we are able to help the PHCC service businesses the most in this area,” he said. “The Stock Service System™ evolved from consistent feedback from our clients losing cash from a lack of inventory control and has changed our position within the industry from just another ‘vendor’ or ‘supplier’ to truly becoming a strategic partner with many PHCC service businesses. "Hodes Co. relies on the strength of the PHCC and its members, and realizes we can’t make a real difference by keeping an ‘arm’s length’ away from those who struggle with organizing their inventory control systems,” Hodes said. “Our goal is to make inventory control information available to every PHCC member so they may stay ahead of the growing competition.” He added the company will be making a CD on the subject at the beginning of July.